Frost tender shrub or small tree with pinnate leaves and usually terminal corymbs of small, fragrant, white flowers several times a year. To 7.5m. [RHSD, Hortus]. 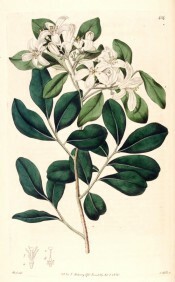 ‘In the East Indies, according to Dr. Roxburgh, this species [Murraya exotica] is generally seen in the state of a large bushy shrub, sometimes in the form of a smaller sort of tree, with a pale cinereous bark. It is known to have been brought many years ago from China to the Coast of Coromandel, where it has continued to be universally cultivated in the gardens ever since. It has likewise been found not unfrequently in the wild state among the mountains of the Northern Circars. Not long ago an unrecorded species was introduced into the Botanic Garden at Calcutta, where it is now cultivated under the specific name of sumatrana, from its native Island Sumatra. Dr. Roxburgh describes this as differing from exotica in being much less bushy, with larger leaves, fewer and bigger flowers, and a very distinct habit. Exotica was introduced by Mr. B. Torin in 1771; and proves a most desirable evergreen for either the conservatory or the greenhouse. It is delightfully fragrant, and the opaque snow-white blossom forms a pleasing contrast with the bright deep green of the foliage. The species appears to be a great favourite with the Chinese; whence it is known among the French in the Isle of France by the name of Buis de Chine.’ [BR f.434/1820]. Introduced to Britain as M. paniculata in 1823. [JD]. Listed in the 1850 and 1857 catalogues [T.690/1850]. Now one of the most popular ornamental shrubs and hedging species grown in Australia. Murraya koenigii Spreng. is the true Curry tree of India.